Topeka, KS – District Attorney Steve Howe requested this afternoon that last of the criminal charges against Planned Parenthood be dismissed. Howe bumped up the dismissal from a scheduled Monday hearing after news leaked that Operation Rescue had obtained documents that prove Howe dropped the 49 most serious charges against Planned Parenthood under false pretenses. New documents obtained by Operation Rescue through Kansas Open Records Act requests prove that records crucial to the criminal prosecution of Comprehensive Health of Planned Parenthood (CHPP) of Overland Park that were said to have been destroyed currently exist and were placed under seal in the custody of the Shawnee County Clerk of the Court by Judge Richard Anderson on January 12, 2012. Documents also obtained from the office of Judge Anderson indicate that there was never any formal inquiry about the records from the Planned Parenthood case prosecutor, Johnson County District Attorney Steve Howe, or from Shawnee County District Attorney Chad Taylor, who was tasked in November, 2011, with determining who was responsible for the destruction of the supposed final copy of the records that were the basis for 49 out of 107 total criminal charges against Planned Parenthood, including 28 felonies. This is evidence that proves that the 49 charges dismissed in November, 2011, at the request of Howe were dropped under false pretenses two months before Anderson moved and sealed the remaining records. It further indicates the possibly the dismissal was the result of a wide-spread criminal conspiracy to obstruct justice. The existence of the records completely refutes statements made by Howe in court on November 9, 2011. There, Howe told District Court Judge Stephen Tatum that the last remaining copies of Termination of Pregnancy reports that were crucial evidence in proving that Planned Parenthood forged records to cover for other crimes had been destroyed by former Attorney General Steve Six in 2009. “The copies that were destroyed by the AG was the last complete copy of the KDHE T.O.P. records,” Howe said, according to hearing transcripts. Howe told the court he needed the originals or original copies to authenticate the copies in his possession, which were the last surviving copies. Since his copies could not be authenticated, Howe asked Tatum to dismiss the 49 counts related to manufacturing evidence. Howe had previously indicated that the Kansas Department of Health and Environment, which had provided copies to former Attorney General Phill Kline in response to a subpoena in 2004, had destroyed the originals in 2005. However, the existence of the records was clearly documented in multiple court records, including the Kansas Supreme Court Ruling, particularly on pgs. 20-23, issued in October, 2010, that remanded the case back to Howe for further prosecution. 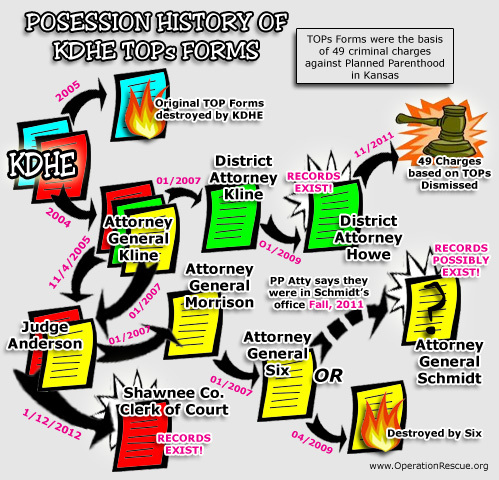 There is a clear record that Judge Richard Anderson had possession of the original copies of the KDHE T.O.P. records obtained by Kline under subpoena since November 4, 2005, when Anderson told Kline to make a copy of the records so the original copy could be held by Anderson. Anderson testified at a hearing held before Judge Tatum on January 18, 2008, that he had concerns that the T.O.P. forms from KDHE and the copies in the Planned Parenthood patient files were not true copies of each other. Anderson had a handwriting expert with the Shawnee County Sherriff’s office examine the records. It was determined that the records that were copied in two different hands. This was strong evidence that Planned Parenthood created the records at a later date and put them into the patient file to make it look like they had been there all along since it is a misdemeanor not to keep a copy of the KDHE form in the patient’s file. In doing so, those records could prove that Planned Parenthood committed a felony to cover up for a misdemeanor. Operation Rescue found independent evidence that is was the case through an open records request made to KDHE on October 26, 2011. The records obtained through that request show that on August 10, 2005, Planned Parenthood’s Sheila Kostas made an E-mail request for information on all the T.O.P. forms submitted by their organization for the years 2000-2004. The Kansas Supreme Court was set to hear oral arguments just a few weeks later on September 5, 2005, concerning whether Planned Parenthood and abortionist George Tiller would have to comply with subpoenas for patient records. Further E-mails obtained by Operation Rescue show that KDHE’s Greg Crawford complied with Kosta’s request the following day. Information supplied by Crawford could have easily been used by Planned Parenthood to create the bogus T.O.P. forms in the event the Supreme Court ordered them to turn over their records. Anderson said he had informed then-Assistant Attorney General Veronica Dersch that there was a problem with the T.O.P. records. She then reported back to her boss, former Attorney General Paul Morrison, who had defeated Kline as Attorney General in 2006 with the promise that he would end Kline’s abortion investigation. Very quickly after that, Mr. Morrison declared that he was not going to do any further investigation of [CHPP], closed the investigation and represented publicly that there was no evidence of wrong doing [sic]. A few days after that he filed a motion to return the records of [CHPP] to [CHPP]. Before I had an opportunity to even rule on that, I – Mr. Irigonegaray [CHPP’s attorney] came to my office, expecting to pick up the records. I said, ‘Well, there’s a problem with the record.’ And he looked confused. And I said, ‘Let me show you.’ And I showed three records and I said, ‘These look like they are the same record and until this gets cleared up I am just going to sit tight on the records.’ Mr. Irigonegaray left the office without the records. And then in a few days, it was probably two or three weeks later, Attorney General Morrison filed a mandamus action against me to try to disgorge me of the records. Supreme Court Chief Justice and said there’s a problem with these records[.] I am going to sit tight. And I sat down like an old mule and just was going to sit on that until everything was cleared up. And sit on them he did, but everything is still far from cleared up. As long as those records existed, Planned Parenthood remained under the real threat of felony criminal convictions for falsifying records to cover for other crimes. This could have jeopardized over $300 million in Federal tax grants that flow to Planned Parenthood organizations every year under the condition that they obey all state and federal laws. In order to protect Planned Parenthood, those records had to appear to have all been destroyed. Kline had to be completely discredited. Thus, Veronica Dersch and Dan Monnet, an attorney for Wichita abortionist George Tiller, filed ethics complaints against Kline alleging wrongdoing, particularly in the handling of the abortion records. Those ethics complaints proceeded under Disciplinary Administrator Stan Hazlett despite the fact that two investigators with the Disciplinary Administrator’s office indicated that Kline had done nothing that warranted such a prosecution. Kline’s arguments in his defense are scheduled to be heard before the Kansas Supreme Court on November 15. Five of the seven justices have recused themselves from hearing the case because of their involvement appeals and mandamus actions related to Kline in the Planned Parenthood investigation and criminal case. From the time that the felony counts were dismissed in November, 2011, Kline had widely expressed concern about the dismissal and said that he believed that Anderson still had a set of the records that could authenticate Howe’s copies. That same month, Attorney General Derek Schmidt asked Shawnee County District Attorney Chad Taylor to conduct an investigation into the Sebelius Administration’s destruction of evidence by Attorney General Steve Six and find out what happened to the records. Taylor did neither. In February of this year, Taylor’s investigation concluded that records destroyed under Sebelius’ man Steve Six on April 7, 2009, did not pertain to Planned Parenthood. Even though evidence of felonies was destroyed while the criminal case was still active, no one was to blame and no one (except Kline, of course) did anything wrong. Case closed – or so he thought. On August 3, 2012, Howe asked for the dismissal of an additional 26 criminal counts against Planned Parenthood related to illegal late-term abortions based on Planned Parenthood’s theory that the statute of limitations had run out before the charges were filed in 2007. This left a case in shambles with only 32 misdemeanor counts left. It was suspected that Howe would ask for the remainder of the charges to be dropped at a scheduled hearing on August 20, 2012. This led Operation Rescue to revisit the convoluted issue of destruction of records. Agreeing with Kline that Anderson still possessed the records, OR’s senior policy advisor Cheryl Sullenger, made an open records request directly to Judge Anderson on August 6, 2012, asking for documentation indicating whether Anderson still had the heavily redacted Planned Parenthood abortion patient records and copies of the T.O.P. reports obtained from KDHE by Kline. In the middle of what amounted to a non-investigation by Taylor, Anderson had created a new document telling the world that the records exist, where they are, and who controls them. Sullenger also requested any documentation of communications between Anderson and Taylor or Howe related to the records in question. Sullenger placed a new open records request by E-mail the next morning for the Protective Order issued by Anderson on January 12, 2012. Within two hours, the Protective Order was in her Inbox. It was obvious that Anderson wanted the world to know that “last complete copy” of the evidence against Planned Parenthood that Howe said had been destroyed, was available all along under Anderson’s diligent protection. No one had ever bothered to ask him for it. The documents that Operation Rescue obtained from Judge Anderson provide the final puzzle piece that reveals a conspiracy between Planned Parenthood, Sebelius Administration associates Paul Morrison and Steve Six, and District Attorneys Howe and Taylor, to obstruct justice and ensure that Planned Parenthood was never fully prosecuted for the 107 crimes filed by District Attorney Phill Kline after a lengthy investigation that originated in 2003 during Kline’s tenure as Attorney General. Implicated in the conspiracy is former Gov. Kathleen Sebelius, who now serves as Secretary of Health and Human Services in the Obama Administration, who was so friendly with late-term abortionist George Tiller that she invited his entire abortion clinic staff to a dinner party at the Governor’s Mansion in April, 2007, at tax-payer expense, according to documentation acquired by Operation Rescue that has never been disproven. She was so friendly with Planned Parenthood that the abortion group threw her a birthday party on May 15, 2007, where Planned Parenthood CEO Peter Brownlie danced the conga line with her in celebration. All this took place while both abortion providers were under criminal investigation. Sebelius personally chose Morrison to run against Kline for Attorney General, after which Morrison’s corruption was dramatically exposed. Sebelius again hand-picked Morrison’s successor, Steve Six, who picked up where Morrison left off, joining with Planned Parenthood to silence Anderson and thwart Kline’s prosecution. There can be no doubt that their actions reflected Sebelius’ own abortion-related objectives and views. Morrison, Six, Howe, and Taylor, all worked to either blatantly destroy evidence of Planned Parenthood’s crimes, disgorge evidence from their custodians so it could be destroyed, or lied about the existence of evidence that was beyond their ability to destroy. It shows that the ethics complaint against Phill Kline was part of the conspiracy that included Morrison’s lieutenant Veronica Dersch and Tiller attorney Dan Monnet, to make sure that Planned Parenthood was never prosecuted. Both disciplinary administrator Steve Hazlett, who hypocritically prosecuted Kline’s ethics case, and Supreme Court Justice Carol Beier lied about Kline not leaving a complete set of records for Morrison in order to discredit him and his case. Schmidt had access to all the investigative records that indicated Anderson retained original copies of the Planned Parenthood evidence. He never mentioned it. In fact, Planned Parenthood’s attorney Pedro Irigonegaray said in an Associated Press article published on February 18, 2012, that the records that Howe said were destroyed by Six were seen by him in Attorney General Schmidt’s office last fall. Schmidt at the least, allowed everyone to believe Howe’s misinformation that the last complete copy of the records was destroyed. At worst, Schmidt was covering up the evidence through misdirection. Except for Phill Kline. He made an honest effort to enforce the law and he stands today falsely accused, wrongly prosecuted, and vilified to the point where he was forced to leave Kansas in order to continue providing for his family. To this day he continues to fight the politically motivated ethics case against him that has cost him personally hundreds of thousands of dollars, his home is Kansas, his career, and his good reputation. Meanwhile, those who dishonestly worked to thwart Kline’s efforts and his case against Planned Parenthood remain in office or have escaped any but minimal consequences for their corruption. These are wrongs that must be righted for there to be any semblance of trust restored in the Kansas judicial system. Right now, a corrupt man sits in the Johnson County District Attorney’s office who was willing to lie to a judge and mislead the public in order to protect Planned Parenthood. He was willing to rush the dismissal of the final charges before word of his duplicity got out. Operation Rescue demands Steve Howe’s immediate resignation. We demand an independent investigation into a conspiracy to obstruct justice. Maybe Judge Anderson’s recent documents released to the unlikely staff of Operation Rescue will be the first step on the road toward righting those wrongs, and maybe not. In the meantime, the political corruption in Kansas that is protecting abortionists from responsibility for their crimes continues.